There are days when I really think that I am "cupcake cursed" because I seem to have trouble baking perfectly risen, domed cupcakes consistently. I like to blame the high altitude, because it really can't be me, can it? It was also Friday the 13th, so maybe I was just jinxed. It was the day before our friends' annual backyard "Shuttlecock Tournament" a day of badminton games, in which, if you want to play, you have to wear a goofy costume - one year, a few girls dressed up as the actual birdie, with little red caps and fluffy white Tu-tus pulled up high around their waists. There's always lots of food, drinks and music, as well as trying to stay cool while hanging out outside all day. 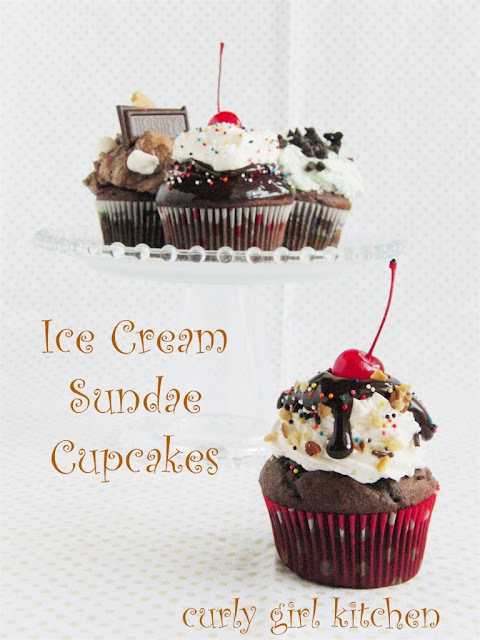 After deciding against trying to make anything badminton-themed, like little birdie-shaped cupcakes, I found myself thinking of cupcakes baked in ice cream cones, then decorated to look like different flavors of scoops of ice cream. 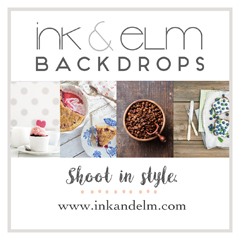 And so I set about baking chocolate cupcakes, turning sugar cones upside down on top of the batter, thinking they would stand up straight and bake really nicely with the cake filling up the inside. The cake did bake up inside the cones really well, but they refused to stand up straight, fell all over the place, got unappealingly soggy from the cake, burned and split open at the points... everything was a complete mess, to say the least. It was also a new cake recipe I hadn't tried before, which is never a good idea when you don't have time to test it. And I've read plenty of recipes online where ice cream cones are baked this way, and come out looking just perfect, so I just don't know why mine didn't. So after wasting ingredients for homemade chocolate cake and 24 sugar cones (all in the trash at this point), it was 9:30 at night and we hadn't eaten dinner yet. I had planned to make goat cheese and mushroom ravioli, with shrimp and white wine sauce, but was too tired and not even really hungry any more, so we warmed up leftovers instead. Saturday morning, I woke up resolved to try again. I had five hours before I had to take my car to get my windshield replaced, after which we would be heading to our friends' house, so I had plenty of time. I mixed up a new batch of chocolate cake batter, filled the muffin cups, and set them in the oven to bake (at this point, I had given up the notion of the ice cream cones). But for whatever reason, the batter overflowed the edges of the pan and sank in the middle of each cake! It was another hot mess. And with a recipe that I'd made into successful cupcakes several times before, so it simply seemed that cupcake karma just wasn't on my side. Twenty-four perfect chocolate cupcakes later, I was ready to decorate with my three flavors of buttercream and a counter covered with an assortment of sprinkles, nuts, ganache, cherries, chocolate, marshmallows and graham crackers. Topped with a decadently unhealthy but delicious amount of buttercream and adorned with their respective garnishes, I finished my ice cream parlor cupcakes with three flavors: S'mores, Mint Chocolate Chip and Ice Cream Sundae. And even without the ice cream cones, I thought they turned out pretty darn adorable, especially all packed up in a couple of pretty striped hat boxes with polka dot lids. I heard they tasted amazing, too, and they disappeared long before the day was over. After all that, I didn't eat a single cupcake! In a stand mixer fitted with the whisk attachment, mix butter, powdered sugar, cocoa powder, vanilla and milk on low until combined, then increase speed to medium and whip for 4-5 minutes, scraping the bowl once or twice, until very light and fluffy. Crumble two of the graham crackers, and stir the crumbled crackers with 1/2 cup of the mini marshmallows into the buttercream. Break the remaining graham cracker along the "cut" lines into 4 pieces, then break each of those in half. Spread the buttercream ("pile" might be a better term, since the buttercream is difficult to "spread" with the add-ins) on top of the cupcakes. 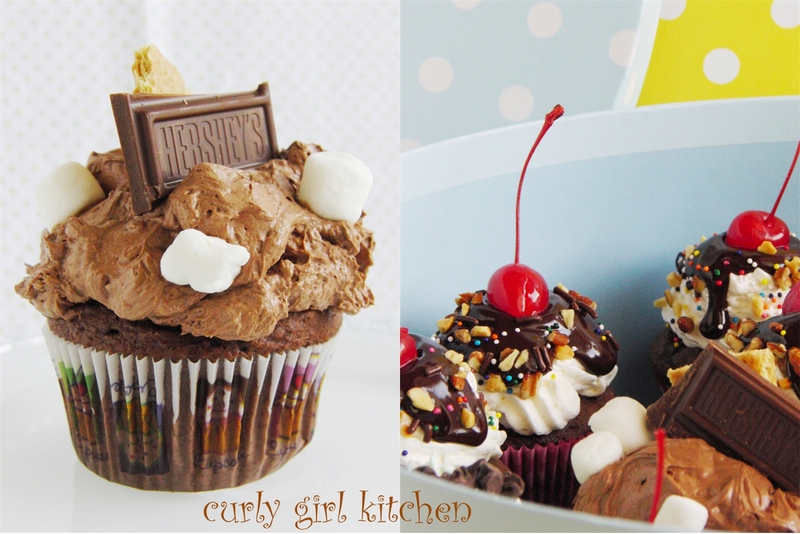 Decorate each cupcake with the remaining marshmallows, a piece of graham cracker, and a piece of Hershey's bar. In a stand mixer fitted with the whisk attachment, mix ingredients on low until combined, then increase speed to medium and whip for 4-5 minutes, scraping the bowl once or twice, until very light and fluffy. Beat a few drops of green gel food coloring and the peppermint extract into the vanilla buttercream, to achieve the desired shade of green. Stir in 1/4 cup of the chocolate chips. 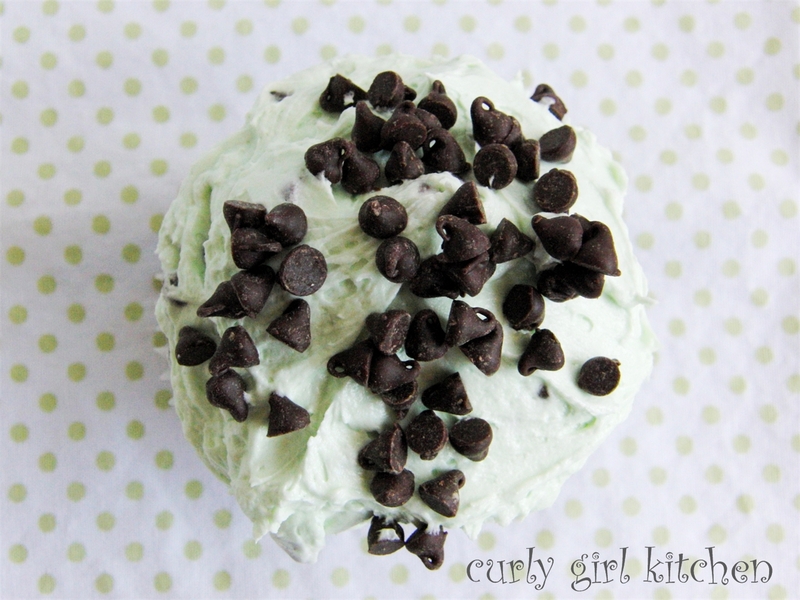 Spread frosting onto the cupcakes then sprinkle the tops with the rest of the mini chocolate chips. 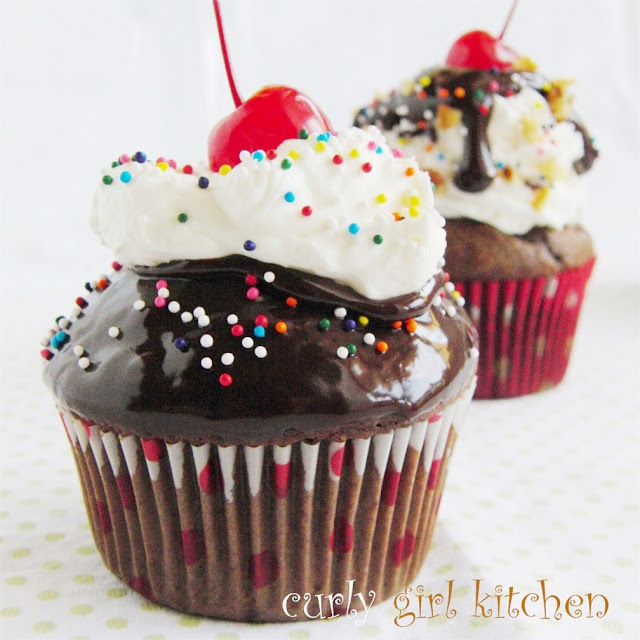 Cook's Note: The cherries need to be dried a little, so that the juice from the jar doesn't run all over the cupcakes. To dry them, place the cherries on two layers of paper towels set on a plate. Let them drain, then trade the paper towels for clean ones, draining them again until very little juice shows up on the towels. Let sit out for about an hour before you place them on the cupcakes. 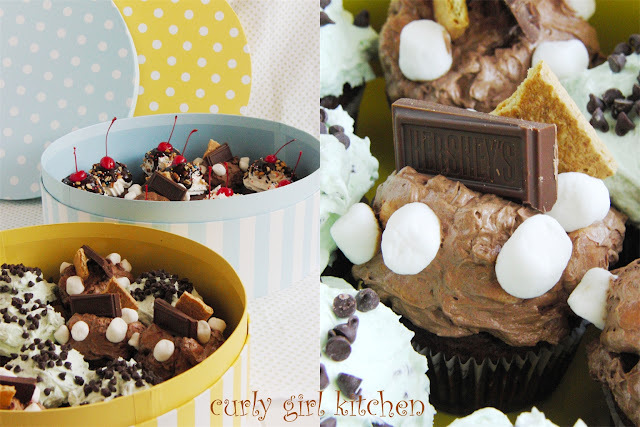 First, you will need to make chocolate ganache, which is what looks like hot fudge dripping over the cupcakes. Pour the heavy cream into a small saucepan and gently warm over medium-low heat, just until bubbles start to form. Meanwhile, chop the bittersweet chocolate and place in a bowl. Pour the hot cream over the chocolate, let stand for 3 minutes, then stir with a spatula until completely smooth. Let cool at room temperature for 15 minutes. Scoop the vanilla buttercream into a piping bag (or plastic zip lock bag) fitted with a star tip. Pipe the buttercream onto 4 of the cupcakes, making it look like soft-serve ice cream. Spoon about two teaspoons of the cooled chocolate ganache over the buttercream, letting it run down the sides like hot fudge. Top with sprinkles, chopped nuts and a maraschino cherry. Take the remaining 4 cupcakes and dip them directly into the ganache, so that they are covered with a smooth layer of chocolate. Pipe the remainder of the vanilla buttercream on top of each, like a mound of whipped cream. 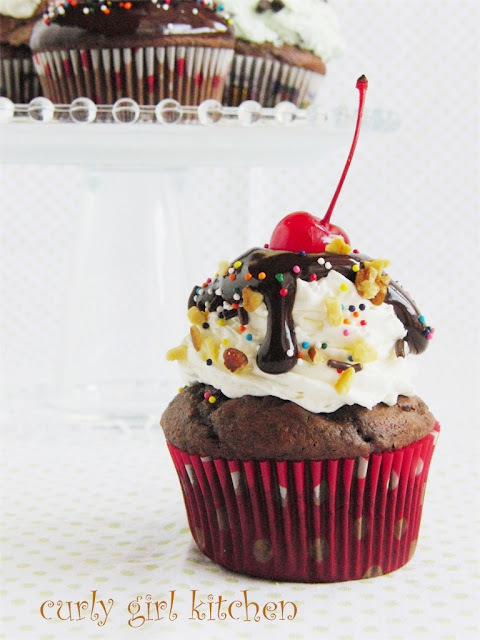 Top with sprinkles, chopped nuts and a maraschino cherry.